The irony of this is that I had to dodge a lot of clouds in order to image clouds. Only one night was clear for long enough that I was able to image two quadrants of the image. Normally I would be imaging unbinned because of the short focal length used (an AT65EDQ at 422mm) and 5.4 micrometer pixels of the ST-9800M. Instead I did this by using 2x2 binning, which results in a speed gain by a factor of something like 3.6 (depending on who you trust as a reference). Each quadrant of the mosaic is based on about 20x300s light frames for a total time of about 6.6 hours. This is an object on the Astronomical League's Bright Nebula list. I might complain to the AL about getting no credit for this, but so far as I can tell they don't publicize this document. When is the AL going to fix this list? It's been over a year since the original posting of the list. But enough about the AL, and more about the mosaic. I actually have two images I could append to the mosaic, one for IC 1318 (butterfly) and DWB 111 (propeller). 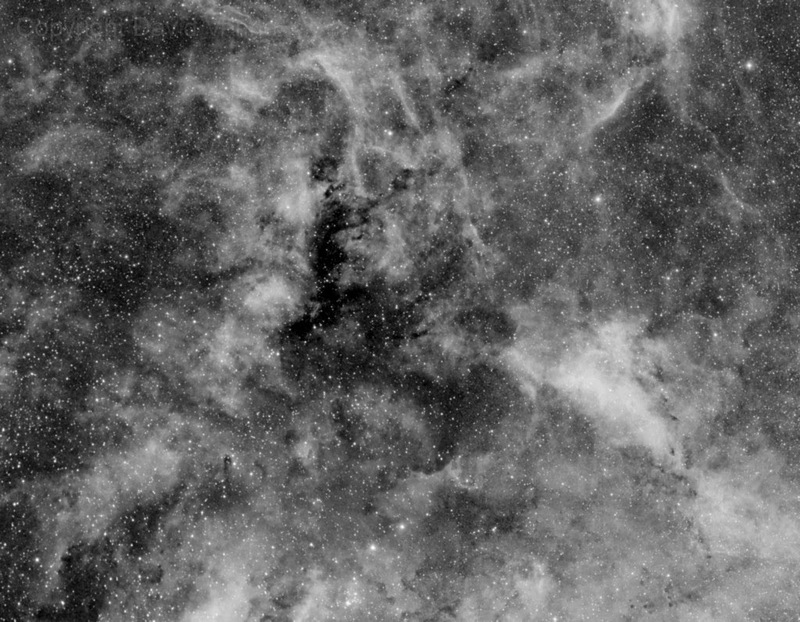 The former is not oriented well, so I'm thinking that in a year I might revisit this and extend the mosaic down to Sadr so that it includes all of IC 1318. But for now it's back to the list, and seeing how much binning helps tackle some of the dimmer objects on the list. LBN 434 is a no-show.